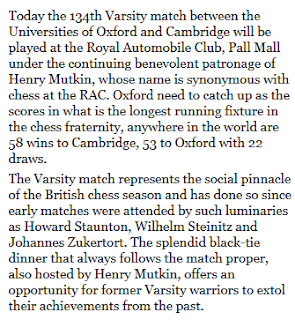 Presumably it doesn't mean that Ray is done with the Varsity Match, nor that the Varsity Match is done with him. Such ought to be the case, since you can either have an event which boasts of the academic traditions of two great universities, or you can have the country's leading plagiarist as a guest. But you cannot have both. Either way, it would be nice, though almost certainly self-deluding, to think that it has begun to filter through what an embarrassment Ray is to the event, to the degree that the event itself has become an embarrassment: even to mention it is to invite saracastic commentary, and entirely merited sarcastic commentary at that. But if you're thinking you've read me saying this before, I guess you're right. It's become part of the tradition. But that's the thing about traditions: you have to change them for things to stay as they are. That's a beautiful quote that you use to lead off your post. I'd never heard it before. I've actually read that it's not that great a translation, or at least that the Italian original is more subtle. Not knowing Italian, I'm not well-placed to comment!
" 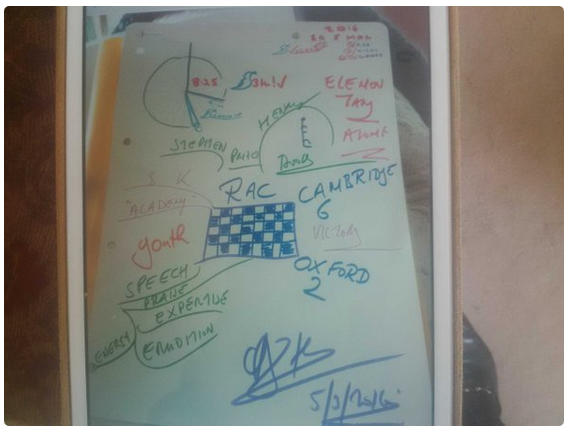 ... his chum and crony Tony Buzan appears to have been present at the "splendid black-tie dinner" and sent Ray what appears to be the menu (is that David Sedgwick's signature at the top?)" It is the menu and it is indeed my signature. Ray Keene was there as usual. I think it's just a coincidence that he wasn't in any of the photographs that you (ejh) saw initially. As you yourself admit, one of the traditions relating to the match is that you will seek to denigrate it on this blog. I think Ray and Tony are managing that qute successfully by virtue of their presence. The oxbridge match is a great tradition, rambling on about a splendid dinner is less so. One is reminded of the mushrooms in Ray's kitchen.